Scientists have discovered the oldest known bee fossil in a Burma mine. 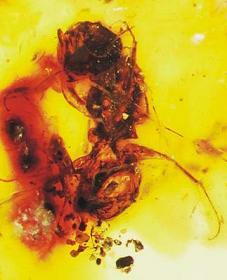 Preserved in amber, the bee is dated at 100 million years old on the evolutionary timeline. So what’s all the buzz about? The LiveScience article states, “The discovery of the oldest bee fossil supports the theory that bees evolved from wasps….”1 Apparently, this ancient bee has narrower hind legs than modern bees (wasps have narrower hind legs than bees). In the evolutionary model, shared anatomical characteristics are seen as evidence of a common ancestor. However, a more critical analysis of the discovery reveals much stronger evidence for the biblical creation model. Lead author, George Poinar, had this to say about the fossil, “This is the oldest known bee we’ve ever been able to identify….” He goes on to say, “…overall it’s more bee than wasp….”1 It is also significant that this supposedly 100 million year old bee fossil sports branched hairs on its legs. This is a characteristic found in modern bees for collecting pollen. This particular fossil bee is a male, and hence it is hard to compare its pollen-collecting features with modern bees, since only females actually collect the pollen. Nevertheless, despite being male, it is still recognizably ‘bee’. If this is so after ‘100 million years’, how is this evidence of evolution? In fact, it is strong, empirical evidence against evolution and positive evidence for creation. Bees are rapidly-reproducing insects. Given 100 million years to reproduce billions of offspring, the sheer number of genetic mutations should have altered bee morphology to a considerable, even overwhelming, degree—even though such an accumulated change would be degenerative overall (ignoring the likelihood of extinction due to such accumulating mutational ‘load’). However, the fact that bee morphology has not changed in any major way strongly suggests that bees have not existed for 100 million years. There simply hasn’t been enough time, enough mutations, or enough generations to effect substantial anatomical change. Evolutionists may respond that some organisms demonstrate very little morphological change because they live in highly specialized environments. In other words, because the environment has remained virtually unchanged, natural selection would preserve the status quo in creature morphology. The problem is that bees live on almost every continent, and in almost every type of climate. And since ‘environment’ refers to not just things like the weather in one’s surroundings, for instance, but to predators, prey, food sources and so on, it seems totally inconceivable to have no significant environmental change in such an incredibly long time period. The fossil evidence paints a much clearer picture. The lack of great morphological change supports the biblical creation model in which bees were created only about 6,000 years ago. Bees have always been bees. Within the bee ‘kind’, there is a considerable amount of variation, but they are still easily identifiable as bees. Some bees have narrower legs than others, but this does not indicate that they shared a common ancestor with wasps! In the creation model, many unrelated organisms share common design features due to a common Designer. For example, moles have keeled sternums and wrist bones that are quite similar to birds,2 yet no evolutionist would ever suggest that they share a close evolutionary relationship. Therefore, it is not surprising that bees and wasps would share some common anatomy. Although different insect ‘kinds’, they are both small flying insects and they share a common Creator. Bees are not the only ‘living fossils’. Countless other living organisms, such as marine invertebrates, insects, fish, amphibians, reptiles, birds, and mammals look very similar to their oldest known fossils. Again, this is strong biological evidence for a recent creation. Creatures were made to reproduce after their own kind, and this is what the fossil record reveals. Ironically, the way in which this bee was fossilized may also point to a massive flood. Entombment in amber (fossilized tree resin) is a rare fossilization event, but there are areas containing large deposits of amber. The formation of such copious amounts of resin, and the circumstances in which such fossils are found, suggests large numbers of broken tree trunks and branches, rapid water transport, wet sediments of clay and sand, and heat.3 It is plausible that Noah’s flood, heated in some locations by mineral-rich ‘fountains of the great deep’3 (Genesis 7:11), provided the necessary geological conditions to entomb this bee in amber around 4,500 years ago. Goudazi, S., Oldest bee fossil creates new buzz, 31 October 2006. Return to text. ‘Birdosaur’ more like a mole. Return to text. The Amber Mystery. Return to text.